KNOW THIS CHILD? : The boy who was found in an abandoned house in Chaguanas and who gave his name as Malik de Freitas. 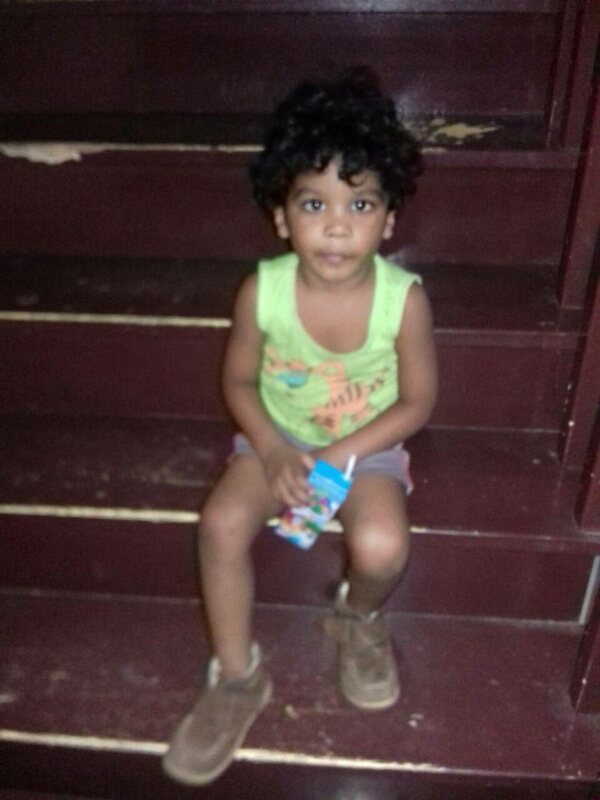 A LITTLE boy, believed to be between two and three years old was found abandoned in a cardboard box in an unoccupied house opposite Dollar Value supermarket in Montrose, Chaguanas shortly after 4 pm yesterday. The boy, who was dressed in a green vest and grey short pants, was rescued from the yard of the house by soldiers who were on patrol in the area. According to reports, soldiers heard a child crying. They checked the unoccupied house and saw the child but no one else was there. The soldiers took the child to their base in Enterprise and contacted ASP Richard Smith of the Chaguanas Police Station who took the child to the station and placed him on a bed to sleep. When the awoke shortly before 5pm, he gave his name as Malik de Freitas but did not know his address. When asked the name of his parents, the child replied: “Mummy and Daddy.” Police fed the child fried chicken and chips and juice. He had a good appetite, police said. The child’s clothing was clean and he did not appear to be abused or challenged in any way. Late yesterday afternoon the boy was taken to the Belmont Police Station by members of the Child Protection Unit (CPU) and is expected to be placed in a home pending the outcome of the efforts to locate his parents. Central Division Police are hoping to secure surveillance footage in an effort to assist them in identifying the parents. Reply to "Toddler found abandoned in cardboard box"